While Americans have been getting used to having the largest passenger ship in the world in their midst, we have been sitting back waiting for the first reactions, which have finally started to come in. So now that she has carried her first guests and is officially due to be named tonight, just what is the 225,282-ton Oasis of the Seas, some 40% larger than any other cruise ship, all about and what will it do for cruising? The Oasis of the Seas is not a conventional cruise ship. The major difference is that her superstructure has been split in two. As ships have gotten larger one of the biggest problems has been that too many inside cabins and interior spaces were created (even on this ship inside cabins run eleven across in one area on Deck 7 forward). In order to address that problem, Royal Caribbean's architects decided to split most of their new ship's superstructure right down the middle. This is something that had its beginnings in the Royal Promenade of the Voyager of the Seas ten years ago, and in the Baltic ferries Silja Serenade and Silja Symphony almost ten years before that. But while those ships had internal promenades, the significant result of this new entirely split superstructure is a number of large inside spaces that are exposed to fresh air and natural sunlight and are not included in the air conditioned mass of the ship (by the way, when it rains people in the Boardwalk have to take cover in order not to get wet). In a way, this split is similar to the principal that was applied to the design of the catamaran, except that instead of the hull, it is the superstructure that has been split. The other thing this design has created is the first inside/outside cabins. While the Superstar Leo introduced the first inside-facing cabins eleven years ago, these were entirely internal and lacked both balconies and access to fresh air. An added attraction to this new type of cabin (which is more expensive to book than an outside cabin that actually faces the sea) is the opportunity to people-watch as the crowds below go about their business. Because of the new ship's huge dimensions, there are many ports that would not be capable of handling the huge numbers of passengers that she can carry. New docks, terminals and even ports have thus been developed for her, and in the existing ports, shoreside facilities have had to be expanded to cope with the sheer numbers of people she will bring with her. The Oasis' draft of 30 feet limits her to only larger ports, and because of her dimensions this is even more the case than with the Queen Elizabeth 2, with 32 feet of draft or Queen Mary 2 with 32 feet 10 inches. She also needs shoreside facilities that are capable of handling 6,000 passengers. The sheer numbers of passengers this ship carries limits the number of ports she can call at. But the fact that this huge 200-foot wide ship has 37 bars and 24 cafés and restaurants, not to mention the wide variety of entertainment options and 10,000 square feet of "retail experience" as the Americans like to call their shops, has really made this ship into a destination in its own right. The Royal Promenade, at twice the width of earlier versions, features restaurants and shops and acts as the central meeting place of the ship. It is much like an American mall, particularly with its Muzak, and in this area, the Rising Tide Bar moves slowly up and down between Deck 5 and Central Park on Deck 8. Central Park, at 350 feet in length, includes boutiques, restaurants with surcharges of up to $35 and bars, and contains 12,175 plants and 56 trees. And from those who have reported so far, many seem to like Central Park at night, after the sun has set. Entertainment Place, with comedy clubs, jazz and blues lounge, nightclub, disco, ice-skating performances, as well as a 1,380-seat show lounge and theatre where a full Broadway musical (right now Hairspray) will be showing, and we didn't even mention the 460 slot machines in the casino. Pool and Sports Zone, with a sloped-entry beach pool and two surf simulators. There is a total of 21 separate swimming pools and hot tubs if the three swimming pools and two surf simulators are included. From here, one can look down into the space between the two superstructures. Inside balcony cabins on the next deck down (Deck 14) overlooking Central Park may tend to be noisy during the daytime because of activity at the pools. Spa and Fitness Centre, including a separate spa for teens, and the opportunity to have a 24-carat gold leaf facial for some huge cost. At tonight's ceremony, the godmothers, each to be represent one of the neighbourhoods, will include Miami-based singer Gloria Estefan, figure skater Michelle Kwan, actress Jane Seymour, swimmer Dara Torres, actress Keisha Pulliam, gymnast Shawn Johnson and television personality Daisy Fuentes. These seven women will name the ship tonight as part of a one-night inaugural fundraiser on board. Tickets are $500 each and will benefit the non-profit Make-A-Wish Foundation, which grants the wishes of children with life-threatening medical conditions. In many ways, this ship will change cruise ship design for the big ship market. Just as the Canberra was the first major cruise ship to have engines aft, her lifeboats at a lower level and many of her cabins above the promenade deck, so Oasis of the Seas' split superstructure introduces an entirely new concept to the design of large cruise ships. This is really the next significant step up from the introduction of balcony cabins in the 1980s, which rendered many modern cruise ships prematurely obsolete. But more than that, this ship is a floating island at sea, even a floating city. Although this was also said about the ships of state that once sailed the seas, this really is a new era. This ship is so huge that hundreds of her outside cabins actually face inwards. And many have already said of this ship that when you're in the bars and restaurants it's hard to believe that you are actually at sea. Where the ships of state had their grand perspectives and winter gardens this ship has a whole mall. For another thing, this ship purely differentiates Royal Caribbean from all other cruise lines as the one with more activities than any other, somewhat ironic since it used to be Carnival's Bob Dickinson that said the real competition was Las Vegas. Royal Caribbean seem to have been listening. It really started with the Voyager of the Seas when she became the destination rather than just a means of getting there. What Will This Do To Cruising? By the time Oasis of the Seas and Allure of the Seas have both been introduced, these two ships alone with be capable of generating 24,000 individual passenger movements every weekend at Fort Lauderdale. With one ship each at the newly-opened cruise ship terminal every Saturday and Sunday, each will handle 6,000 passengers in each direction. This weekly exchange of 12,000 guests each way is enough to fill more than two dozen Boeing 747s both in and out. Of course, not all passengers will arrive by air but the same number would fill sixty Airbus A320s. These numbers are huge. This is without even considering that these ships will bring 6,000 extra visitors every week to their chosen ports of call. At the line's "private island" peninsula of Labadee in Haiti they have built a roller coaster to keep the crowds happy as well as a new dock (see "New Ports: Coney Islands of the Seas?" November 9). And a whole new port is now being built at Falmouth, Jamaica. 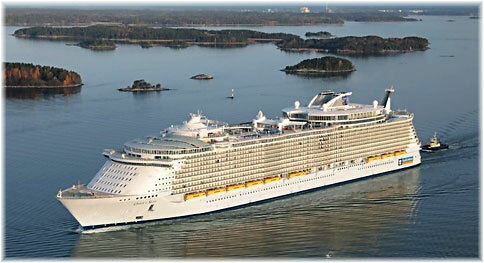 Speculation a while back was that Royal Caribbean would order a third such ship, and they may yet do. But these two will take all the weekend capacity at their new terminal in Fort Lauderdale, so where would a third one dock? Would people be willing to sail on a Friday or a Monday? Could 6,000 be raised twice a week for shorter 3- and 4-day cruises, to the Bahamas, or perhaps to Cuba when it re-opens, or would 6,000 people be willing to cruise for two weeks a ship so large? Some do say that more than a week is needed to cover all the activities that are offered, and at least the embarkation terminal logistics would be cut in half with a longer cruise, but the US market is heavily wed to the present 7-day formula, especially as they get so many fewer days holiday than Europeans. Another way of splitting the load would be to embark at two ports, which is done in the Mediterranean, for example, where all of Costa, MSC and Louis now embark passengers on the same ship from both Genoa (or Savona in the case of Costa) and Marseilles every week. With a ship the size of the Oasis of the Seas, this would mean only having to handle 3,000 each way at each port, or only 2,000 if say Barcelona were added as a third embarkation port (the 3,114-guest Voyager of the Seas is now based there). With fourteen decks of accommodations, the rotation could be limited to certain decks, or even one side of the ship and its split superstructure. In the Caribbean, however, the choices are less obvious. San Juan and Barbados could supply a two-port option, or soon Havana and Barbados. The multi-port boarding concept has proved itself in Europe and could also work in the Caribbean with the right ports. Should the price of fuel rocket again (these ships are said to be 30% more fuel efficient per passenger than their predecessors), another choice could be to place the ship alongside at a fair weather resort with good beaches and just fly the crowds in and out. While this would have the advantage of going to new areas, a good airport would still be required nearby. It would also have the advantage of being able to move the ship and change the resort with the seasons. However, these ships were built to cruise. And It is likely that hoteliers at existing resorts would object to the prospect of someone parking a new 2,706-room hotel right next door, especially one that included double-deck Loft Suites with a baby grand piano that are larger than the average American home. Different placements and positionings could well become more likely however as the ship is in essence a resort that lacks only a real beach! Another variation, and one that may be more likely, would be to sail from Fort Lauderdale to say Havana and stay in port for three or four days of entertainment and exploration (particularly as Havana does not have the hotel capacity to accommodate such numbers). But this would have to be done in such a way as to retain on board revenue if fares were not to rise. Royal Caribbean has even looked at 7-day cruises to nowhere, but found that their core market would not be interested in this.Another shorter-term option would be to use these ships occasionally as floating hotels, just as has been done and will be done at many games, including the Vancouver Olympics and the Cape Town World Cup in 2010. Whatever happens now that cruise ships have reached this size, there is no going back. For certain, the question of logistics has been raised another notch and these ships will most certainly influence where the market, or at least part of it, goes. Perhaps the biggest question is really whether the size of ships can keep growing. With split or multiple superstructures, who is to say that projects in the million ton range that have been mooted in the past might not one day become reality? After all, some cities now have floating airports. After his cruise in the Oasis here is what Stephen Bleach from "The Sunday Times" had to say: "If constant activity, organised entertainment and mountains of carbs are what you're looking for - and God knows they keep the kids happy - this is the best ship afloat. If they're not ...," well you can form your own conclusion. Most have been satisfied and find that the new ship, with all it has to offer, has exceeded their expectations, and there has been an overwhelmingly positive response from travel agents who travelled in her last week. To date this 6,296-berth ship has been running only half full so we must still wait to see how the great public greet her when she departs with her first capacity load. The Oasis of the Seas may not be for everyone, and some people are waiting to see if there will be crowds and long queues, but bets are on that those who book her will like her. But the big question is, is it still cruising or should it be called something else? This ship is actually changing the meaning of the word.